Also, A limited number of $65 VIP tickets will include soundcheck access, a meet and greet and an official event poster. NJProghouse discount: Receive $2 off one (1) GA ticket with a special promo code from THE NJ PROGHOUSE. As many fan’s who play close attention know, Goblin faced frequent line up changes since the very beginning. This will continue with the upcoming tour in December, as longtime and key members Fabio Pignatelli (bass) and Agostino Marangolo (drums) join Massimo Morante and Maurizio Guarini in this new old line up, making 4/5 of the original band back from 1975. The Italian Soundtrack Kings will perform all of their classic cuts, including scores from Deep Red, Suspiria, Tenebrae, and other songs that are milestones among prog rock followers, including songs from Roller, Il fantastico Viaggio del Bagarozzo Mark, and most recent Back to the Goblin. Other famous scores never performed live anywhere will be included on this tour. First signals of a reunion started 8 years ago when Massimo Morante and Maurizio Guarini, together with other members of Goblin, released a new album, Back to the Goblin, after a long absence. The band felt it was time to expose the music to new generations of fans and invigorate their loyal following. 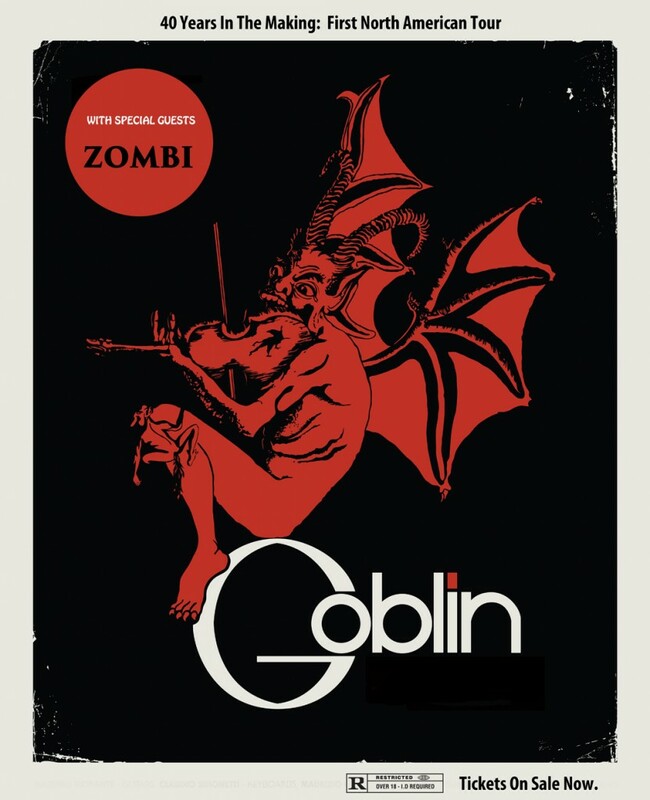 In 2009, Goblin started touring the world, hitting the major European cities including Rome, Paris, London, Berlin and many others (in 2010 Claudio Simonetti re-joined the band). The band found the tour to be a great success, and the fan base kept growing, bringing back the old enthusiastic crowds of the seventies and converting new fans of all ages along the way. To follow this up, in 2011/2012 the band ventured to Japan and Australia and met the same enthusiasm. This led to an increased desire to come to North America as a full band for the first time ever. Producing work that is epic in concept, sound, and artistic approach, Steve Moore and A.E. Paterra, the masterminds and multi-instrumentalists behind Zombi, have re-imagined the architecture of progressive rock and dynamic instrumentals, carving a niche in underground music distinctly their own. The band’s signature sound, achieved using only electric bass, drums, and a collection of analog synthesizers, is deceptively lush considering its two man skeleton crew ensemble. Moore’s bass playing and meticulous synthesizer programming interacts seamlessly with Paterra’s controlled, precision drumming, as if each man is anticipating his counterpart’s next move. 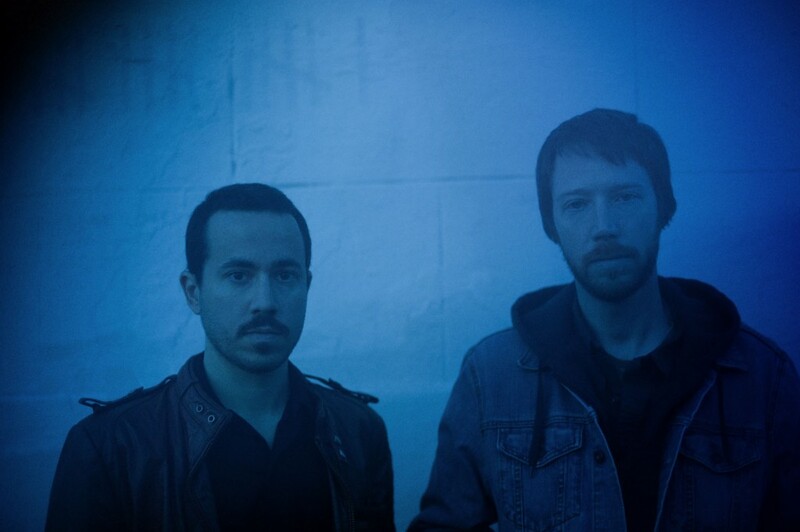 Punctuated by Moore and Paterra’s seasoned songwriting skills, each Zombi song, whether grand in design like Light Rhythms from the band’s forthcoming LP or powerful and driving like Orion, the opening track on Cosmos, is entirely autonomous and true to the duo’s creative vision. Larger in scope and sound, Surface To Air is an evolutionary album, anchored by the distinct melodic and technically complex sound Zombi has become known for, but more mature and forward-thinking in its overall conceptual approach. While the track listing may at first appear lean at a mere five songs, the attentive listener will soon realize that Moore and Paterra have composed and assembled more than 40 minutes of emotive, dynamic, multi-layered music making Surface To Air a magnum opus in its own right. Informed by the music and boundary-pushing work ethic of icons like Genesis, Tangerine Dream, Van Halen, and Pink Floyd, Moore and Paterra rely just as much on inspiration from the past as they do on their own skill and musical knowledge during the songwriting process. On Surface To Air, the integrity of tracks like Challenger Deep with its powerful, driving bassline, and the mysterious mounting tension of Digitalis are indisputable evidence of Zombi’s artistic growth and allegiance to producing a diverse and progressive body of work. Legacy,however, sidesteps, revealing a more introspective direction in Moore and Paterra’s work, while the album’s title track, Surface To Air, opens with a frantically-paced and hypnotic synthesizer-laden melody. Experimenting with a vast new sound, Zombi proves that charging forward with an expansive vision can open doors to an entirely new realm. While Moore and Paterra still draw inspiration from the horror genre when composing film scores, a broader range of influences?s well as a desire to push the boundaries of what they?e already accomplished?ow informs the material for their albums. Whether you?e an adventurous listener, diehard fan, or skeptical observer, delving into the latest chapter of Zombi? prolific and ever-evolving work will never disappoint. Subscribe to our email list for up to the date show announcements and exclusive special offers on tickets.